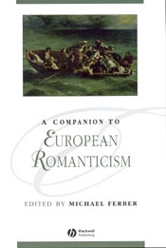 This companion is the first book of its kind to focus on the whole of European Romanticism. - Describes the way in which the Romantic Movement swept across Europe in the early nineteenth century. - Covers the national literatures of France, Germany, Italy, Poland, Russia and Spain. - Addresses common themes that cross national borders, such as orientalism, Napoleon, night, nature, and the prestige of the fragment. - Includes cross-disciplinary essays on literature and music, literature and painting, and the general system of Romantic arts.